Bridal shower games are fun but one can also utilize the knowledge and wisdom of the guests that have gathered on the bridal shower party. That is why I have created these free printable recipe for a happy marriage card. These cards will serve as a keepsake for the bride to be. This is more than a game. The bridal shower guests will share the recipe for a happy marriage according to their knowledge and experience with the bride to be. 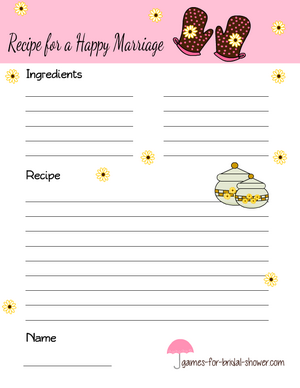 How to Play: Print the recipe for a happy marriage game cards and distribute these among the bridal shower party guests along with a pen or pencil. Ask them to write the ingredients and recipe for a happy marriage that they think works the best. Collect and give the cards to the bride-to-be. The guest whose recipe that she will like the most will be the winner. The bride-to-be can then keep these cards as the memory of her bridal shower. Click on the image shared above to view the larger version of these printable cards. 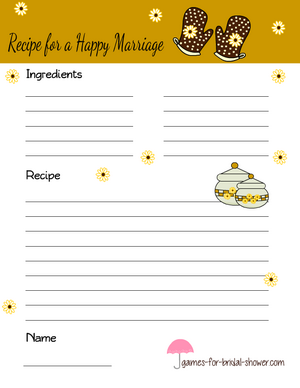 These adorable recipe cards are decorated with an image of kitchen mitts and two cute cooking parts. There are daisies spread all around the paper that make this design prettier. 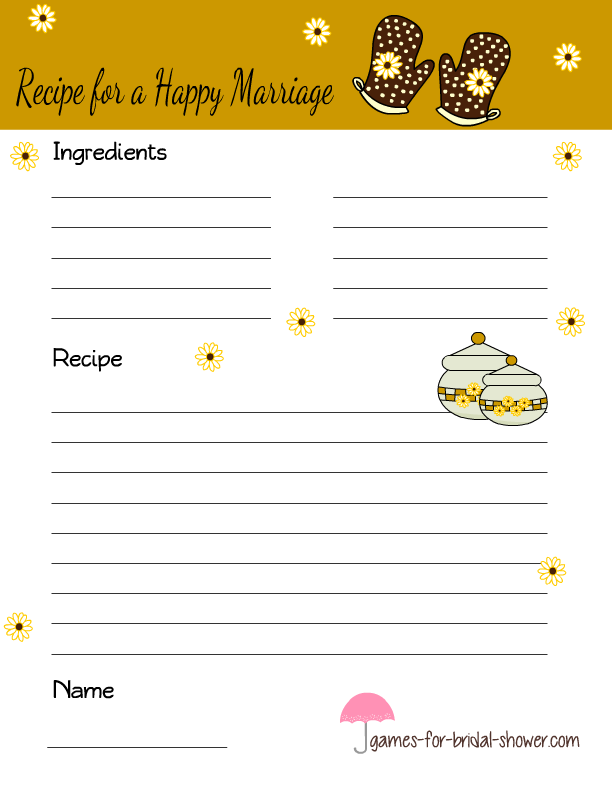 I always make my game printables in 3 or 4 colors. Click on the image shared above and a bigger printable image witha pink header will open up. You can save it to your computer and print it later. This is another printable for this game in mustard and brown color. You can print this game in a single color or even in all three colors if you cannot choose between the options that I have provided.